A coolant leak at the Three Mile Island’s Unit 2 nuclear reactor outside Harrisburg, Pennsylvania leads to the core overheating and a partial meltdown. Prague, 23 December 2004 — The Soviet invasion of Afghanistan is generally thought to have begun on 24 December 1979, when three Soviet divisions took control of airfields in and around the capital, Kabul. On 26 December, additional Soviet regiments moved south toward the Afghan border. Finally, on 27 December, 700 Soviet special troops stormed the presidential palace in Kabul, killing President Hafizullah Amin, who had come to power only three months earlier. In a recent interview with RFE/RL’s Afghan Service, Amin’s widow, Patmana, recalled the events of that day. She said she became separated from her husband, and that the attackers kept her and children on the second floor of the palace during the night. She said that when she went upstairs in the morning, she saw the bodies of some of those killed in the assault. Afghan radio announced that Amin had been sentenced to death at a revolutionary trial for “crimes against the state” and that he had been executed. Former Deputy Prime Minister Babrak Karmal, who had been living in exile in Eastern Europe and was seen as more compliant by Moscow, became the new president and secretary-general of the ruling People’s Democratic Party. Historians believe several reasons were behind the invasion. The Soviet Union, seeking to maintain or expand its influence in Asia, wanted to preserve the Marxist regime that had taken power in Afghanistan in 1978 but which was collapsing due to civil war and anticommunist sentiment in the country. On 27 December, 700 Soviet special troops stormed the presidential palace in Kabul, killing President Hafizullah Amin. The Kremlin also wanted to secure its interests in Afghanistan from Iran, which was engulfed in the Islamic Revolution, and also from the West. The United States recalled its ambassador from Moscow and together with many other Western countries boycotted the 1980 Olympic Games in Moscow. But that was the least of Moscow’s concerns. A fierce guerrilla war ensued, and Soviet troops found themselves unable to control the countryside or even the smaller cities. Within a few years, the Soviets’ inability to seal Afghanistan’s borders enabled the mujahedin to create a pipeline for weapons and recruits from abroad. The Soviets initially deployed an estimated 30,000 troops to Afghanistan. Ultimately, the occupation force was boosted to 100,000 soldiers, but it did not help. Lieutenant General Aleksandr Mayorov was a senior Soviet military adviser to the Afghan regime in 1980 and 1981 and is the author of the book “The Truth About The Afghan War.” In an interview with RFE/RL, Mayorov said that after the success of the initial invasion, Soviet troops in Afghanistan became desperate. The Afghan resistance was supported for different reasons by the United States, China, and Saudi Arabia, with weapons and fighters channeled through Pakistan. As the war progressed, the rebels improved their organization and tactics and began using imported and captured weapons, including U.S. Stinger antiaircraft missiles. Mayorov said Soviet troops became increasingly demoralized. Some 22,000 had been killed by the end of the war. Kirill Koktysh of the Moscow Institute of International Relations said that, looking from a historical perspective, the Soviet invasion of Afghanistan was the last gasp of the Cold War. “Essentially, it was the last war and the last event of a bipolar world, when the world was understood as the place where Soviet and American ideologies had to compete,” Koktysh said. Koktysh said that the war turned out to be destructive for both Afghanistan and the Soviet Union. Half of Afghanistan’s agriculture sector was wiped out and 70 percent of its paved roads destroyed. Some 5,000 of the country’s 15,000 villages were destroyed or economically ruined due to damage to roads and wells. Moscow finally withdrew its troops in February 1989, only to see the Soviet Union itself collapse a few years later. The Soviet withdrawal began a long period of instability in Afghanistan. After Soviet forces left, a number of Afghan factions continued to fight for control of the country. The radical Taliban Islamic militia came to power in 1994. It was ousted by U.S. troops in late 2001 in the wake of the 11 September terrorist attacks. Those attacks were blamed on the Al-Qaeda network of Osama bin Laden, who was being sheltered in Afghanistan by the Taliban. The Soviet invasion is also blamed for the rise of Islamic militancy. Foreign fighters who came to fight Soviet troops perceived their eventual withdrawal as their victory. The war created a class of hard-line Islamic fighters, such as bin Laden, ready to fight for what they perceived as the interests of Islam around the world. The United States Embassy in Islamabad, Pakistan, is attacked by a mob and set on fire. On 21 November 1979, Pakistani people, enraged by a radio report claiming that the United States had bombed the Masjid al-Haram, Islam’s holy site at Mecca, stormed the U.S. embassy in Islamabad, and burned it to the ground. The Grand Mosque had suffered a terrorist attack, but the U.S. was not involved. The U.S. diplomats survived by hiding in a reinforced area, although Marine Security Guard Corporal Steven Crowley, 20, Army Warrant Officer Bryan Ellis, 30, and two Pakistan staff members were killed in the attack. On 20 November 1979, a Saudi Arabian Islamic zealot group had led a takeover of the Mosque in Mecca. The group’s demands included calling for the cutoff of oil exports to the United States and the expulsion of all foreign civilian and military experts from the Arabian Peninsula. However, Iran’s Supreme Leader Ayatollah Khomeini allegedly claimed that Americans were behind the attack on Islam’s holiest place. This claim was repeated in media reports the morning of 21 November. The event started as a small, peaceful protest against U.S. policies in Cambodia, as well as suspected U.S. involvement surrounding the military coup d’état of Zulfikar Ali Bhutto in 1977. The protesters shouted anti-American slogans. At first glance the event seemed to be a small protest outside the embassy’s walls. Later, buses filled with Jamaat-i-Islami supporters began arriving in front of the main gate. Hundreds of people began climbing over the walls and trying to pull the walls down using ropes. According to an American investigation, the protesters opened fire after a bullet fired at the gate’s lock by one rioter ricocheted and struck other protesters. Who actually fired first has not been determined. Twenty-year-old Marine Steve Crowley was struck by a bullet and transported to the embassy’s secure communication vault along with the rest of personnel serving in the embassy. Locked behind steel-reinforced doors the Americans waited for help to come and rescue them from the smoke-filled building. After nightfall a Marine unit was able to sneak out a back exit from the vault as the front door was too damaged to open. Finding the embassy empty they led the rest of the 140 people from the vault out into the courtyard. On February 17, 1979, troops from the People’s Republic of China attacked the Socialist Republic of Vietnam in what became known as the Sino-Vietnamese War. Although for many years China and the regime in Hanoi had been allies, “as close as lips and teeth,” this “marriage of convenience” slowly began to fall apart beginning in the 1970s when China was unable to match the Soviet Union in military support to Hanoi. Vietnam’s occupation of Cambodia directly threatened Chinese interests in the region. China could not sit idly by while the Vietnamese had their way in Cambodia. Beijing sent several thinly veiled warnings to Hanoi, but Vietnamese officials responded by agreeing to discuss long-standing “border/ territorial issues” only, refusing to address the presence of Vietnamese troops in Cambodia, which was the main point of contention in the escalating tensions between the two countries. On February 15, 1979, Chinese paramount leader Deng Xiaoping publicly announced China’s intention to strike back at the Vietnamese invasion of Cambodia. At dawn on the morning of February 17, the Chinese People’s Liberation Army launched a “punitive” expedition against Vietnam, attacking at numerous points along the 480-mile Sino-Vietnamese border after a massive artillery and rocket barrage. The overall commander of the PLA forces was General Xu Shiyou, a member of the Politburo and a longtime supporter of Deng Xiaoping. Xu’s deputy, General Yang Dezhi, was in tactical control of the operations. Yang also had been the deputy commander of Chinese troops during the Korean War, during which he had developed the tactics of infiltration and envelopment followed by mass attacks. Yang was chosen to take tactical control due to the similarity of the terrain in northern Vietnam to that in Korea. Once the attack was joined in earnest, Beijing, concerned about Soviet reaction to the invasion, issued statements to deter Soviet intervention, justifying the action by claiming that it was in response to repeated violations of Chinese territory by Vietnamese troops. Furthermore, Beijing announced that Chinese troops would stay in Vietnam only for a short while and that talks should be initiated to resolve the border conflict as soon as possible. In response to the Chinese attack across the border, the Soviets sent several naval vessels to Vietnamese waters and initiated a Soviet arms lift to Vietnam. The Soviet military attaché in Hanoi threatened that the USSR would “carry out its obligations under the Soviet-Vietnam treaty,” but Moscow made it clear to Beijing that it would not intervene as long as the conflict remained localized along the common border between China and Vietnam. The Chinese appear to have had several reasons for launching the attack. First, China wanted to punish Vietnam for the invasion of Cambodia and the toppling of the Pol Pot regime. They hoped that their massive attack would force Vietnam to withdraw troops from Cambodia and thereby remove the pressure on Pol Pot’s forces there. Second, the invasion was designed to deter extension of Vietnamese power across the border into China. Whether this threat was real or not was irrelevant; the Chinese made several statements reiterating their claims that there had been Vietnamese incursions into Chinese territory and that China would defend its territory and people from any Vietnamese aggression. Third, China was concerned about increasing Soviet influence and power in Southeast Asia. By attacking Moscow’s key ally in the area, Beijing could cast doubt on the extent of Soviet power in the region and thus avoid a direct threat to China while dealing a blow to Soviet prestige. The invading force included 11 Chinese armies of regular ground troops and militia from the Kunming, Chengdu, Wuhan, and Guangzhou military regions. It is thought that troops from Fuzhou and Jinan military regions also participated; if this is true, it means that troops from six of China’s 11 military regions were involved in the campaign. Estimates of the total number of Chinese troops committed range from 200,000 to 450,000. The attacking forces included about 200 tanks and massive amounts of supporting artillery. After the initial broad thrust across the border, the Chinese attack focused on three objectives: Lang Son, Cao Bang and Lao Cai. Arrayed against the attacking Chinese forces were about 15 Vietnamese combat regiments controlled by four regular divisions – a total force of about 50,000 augmented by local militia and border guards. Most estimates put the total number of Vietnamese defenders at around 130,000. The initial Chinese plan was to forge a shallow penetration all along the front, hoping to draw into battle and destroy the regular Vietnamese divisions, which the Chinese felt would be compelled to react to protect the provincial capitals and important communication centers that were threatened by the advance. This would result in major battles of attrition in which Chinese forces would inflict heavy punishment on the Vietnamese defenders. The main Chinese attack appeared to be against Lang Son, a provincial capital on the hills overlooking the Red River Delta, which lay only about 150 kilometers from Hanoi. The Chinese began their assault against Lang Son with an artillery barrage. After the barrage lifted, Chinese 55th Army attacked to seize Dong Dang and was to continue the attack toward Lang Son. At the same time, Chinese 43d Army initially focused on the Vietnamese positions in the hills around Chi Ma, and after taking the town was to turn northwest to secure its ultimate objective, Lang Son. For the attack on Lang Son, Chinese 54th Army was in reserve, following 55th Army. The plan called for 43d and 55th armies to link up southwest of Lang Son, effectively isolating Vietnamese 3d Division there, where it could be destroyed or forced to surrender. The Chinese had hoped to fight “battles of quick decision,” but their attacks were conducted in a slow and deliberate manner, normally involving massive frontal attacks that relied upon the weight of numbers and firepower to defeat the Vietnamese defenders. The Chinese also used tanks, which surprised the Vietnamese given the hilly nature of the terrain in the area, but the tanks proved useful in bunker busting. Chinese 43d Army achieved some success, but 55th Army’s attack was slowed by stiff resistance that employed spoiling attacks, minefields and heavy artillery to disrupt and disorganize the Chinese advance. The terrain favored the Vietnamese defenders, and they occupied hills from which they could place devastating plunging fire on the attackers. Against this resistance, the Chinese were unable to maintain sufficient operational tempo to overcome the Vietnamese. Ultimately, Chinese 54th Army had to be committed to the fight. The reinforcements made the difference, but even so, the battle for Lang Son was not over until March 5. On the Cao Bang front, the attack began on February 17 with Chinese 41st and 42d armies attacking on two separate axes of advance toward the town. These forces would be supported by elements of 12th, 20th and 50th armies. The force allocated to this front numbered around 200,000 troops. Chinese 41st Army was to cross the border and attack Cao Bang from the north, while 42d Army was to attack it from the southeast. As on the Lang Son front, the Chinese advances were slow and deliberate against stiff Vietnamese resistance. Chinese 42d Army made some progress, but the cost was high; in one engagement, the Vietnamese knocked out a number of Chinese tanks. As at Lang Son, the terrain favored the greatly outnumbered Vietnamese defenders, and they made the Chinese pay for every inch they advanced. Eventually, the sheer numbers of Chinese troops prevailed and Cao Bang fell on February 25. Heavy fighting continued on the Cao Bang front for the next five days, but on March 3, Chinese forces from the Cao Bang and Lang Son fronts linked up at Duet Long, on Highway 4, effectively closing the gap between the two Chinese thrusts. On the Lao Cai front, the Chinese had attacked with elements of three armies, more than 125,000 troops. Chinese 11th Army attacked across the border from the northwest to seize the town of Phong Tho, about 65 kilometers from Lao Cai, to prevent reinforcement from the west. At the same time, 13th and 14th armies attacked south to seize Lao Cai itself. The Vietnamese defenders in this area included six regiments, totaling about 20,000 troops. As on the other fronts, the out numbered Vietnamese troops put up a stiff defense; after five days, the Chinese had advanced only a few kilometers. The Chinese employed human wave attacks to overcome the Vietnamese positions, but the battle continued until March 5 when Lao Cai fell to the attackers. While the main Chinese thrusts focused on Lao Cai, Cao Bang and Lang Son, several supporting attacks were conducted elsewhere along the China-Vietnam border. Many of these attacks resembled the larger Chinese operations. For example, in Quang Ninh, on the eastern edge of the border, a platoon of Vietnamese held up an attack on Cao Ba Lanh Mountain for five hours, inflicting 360 casualties on the attacking Chinese force that numbered over 2,800 men. The day after the Chinese captured Lang Son, Beijing declared that the gate to Hanoi was open; that the Vietnamese had been sufficiently chastised; and announced that it was withdrawing its forces. By March 16, all Chinese forces had crossed the border back into China, blowing bridges and railroads and generally laying waste to the Vietnamese countryside along the way. The Hitchhiker’s Guide to the Galaxy by Douglas Adams is published. The Hitchhiker’s Guide to the Galaxy is the first of five books in the Hitchhiker’s Guide to the Galaxy comedy science fiction “trilogy” by Douglas Adams. The novel is an adaptation of the first four parts of Adams’ radio series of the same name. The novel was first published in London on 12 October 1979. It sold 250,000 copies in the first three months. 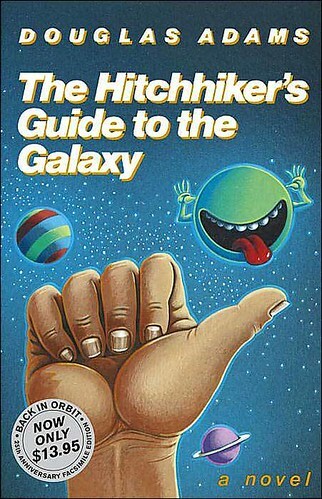 The namesake of the novel is The Hitchhiker’s Guide to the Galaxy, a fictional guide book for hitchhikers written in the form of an encyclopedia.The book begins with council workmen arriving at Arthur Dent’s house. They wish to demolish his house in order to build a bypass. Arthur’s best friend, Ford Prefect, arrives, warning him of the end of the world. Ford is revealed to be an alien who had come to Earth to research it for the titular Hitchhiker’s Guide to the Galaxy, an enormous work providing information about every planet and place in the universe. The two head to a pub, where the locals question Ford’s knowledge of the Apocalypse. An alien race, known as Vogons, show up to demolish Earth in order to build a bypass for an intergalactic highway. Arthur and Ford manage to get onto the Vogon ship just before Earth is demolished, where they are forced to listen to horrible Vogon poetry as a form of torture. Arthur and Ford are ordered to say how much they like the poetry in order to avoid being thrown out of the airlock, and while Ford finds listening to be painful, Arthur believes it to be genuinely good, since human poetry is apparently even worse. China’s relations with Vietnam began to deteriorate seriously in the mid-1970s. After Vietnam joined the Soviet-dominated Council for Mutual Economic Cooperation and signed the Treaty of Friendship and Cooperation with the Soviet Union in 1978, China branded Vietnam the “Cuba of the East” and called the treaty a military alliance. Incidents along the Sino-Vietnamese border increased in frequency and violence. In December 1978 Vietnam invaded Cambodia, quickly ousted the pro-Beijing Pol Pot regime, and overran the country. China’s twenty-nine-day incursion into Vietnam in February 1979 was a response to what China considered to be a collection of provocative actions and policies on Hanoi’s part. These included Vietnamese intimacy with the Soviet Union, mistreatment of ethnic Chinese living in Vietnam, hegemonistic “imperial dreams” in Southeast Asia, and spurning of Beijing’s attempt to repatriate Chinese residents of Vietnam to China. In February 1979 China attacked along virtually the entire Sino-Vietnamese border in a brief, limited campaign that involved ground forces only. The Chinese attack came at dawn on the morning of 17 February 1979, and employed infantry, armor, and artillery. Air power was not employed then or at any time during the war. Within a day, the Chinese People’s Liberation Army (PLA) had advanced some eight kilometers into Vietnam along a broad front. It then slowed and nearly stalled because of heavy Vietnamese resistance and difficulties within the Chinese supply system. On February 21, the advance resumed against Cao Bang in the far north and against the all-important regional hub of Lang Son. Chinese troops entered Cao Bang on February 27, but the city was not secured completely until March 2. Lang Son fell two days later. On March 5, the Chinese, saying Vietnam had been sufficiently chastised, announced that the campaign was over. Beijing declared its “lesson” finished and the PLA withdrawal was completed on March 16.In 1986 China deployed twenty-five to twenty-eight divisions and Vietnam thirty-two divisions along their common border. The Soviet ballet dancer Alexander Godunov defects to the United States. Alexander Godunov was a Russian-American ballet dancer and film actor, whose defection caused a diplomatic incident between the United States and the Soviet Union. On August 21, 1979, while he was on a tour with the Bolshoi Ballet in New York City, Godunov contacted authorities and asked for political asylum. After discovering his absence, the KGB responded by putting his wife, Lyudmila Vlasova, on a plane to Moscow, but the flight was stopped before take-off. After three days, with involvement by U.S. President Jimmy Carter and Soviet leader Leonid Brezhnev, the U.S. State Department was satisfied that Vlasova had chosen to leave of her own free will, and allowed the plane to depart. Vlasova later said that while Godunov loved American culture and had a long desired to live in the United States. Margaret Thatcher becomes the first female Prime Minister of the UK.